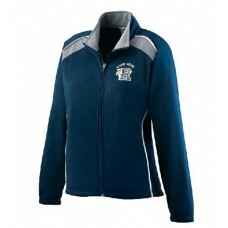 Shop4Teams is your online go to superstore for ladies warm up jackets and warm up pants in a variety of colors and styles. We offer teams discounted prices and the friendliest customer service around. With games in all types of weather coaches and players need warmup jackets to protect them from the elements and keep their players’ muscles limber. Size chart Brushed back 90% polyester/10% spandex, 4-way stretch woven fabric * Wicks Moisture.. Size chart100% Brushed Tricot Polyester Cover.. Size chart Agil-Knit™ is a 100% polyester brushed tricot with a peached finish * Ladies' f.. Size chart Brushed back 90% polyester/10% spandex knit.Soft brushed back poly/spandex knit . &n.. Size chart Ultra-lightweight Aero-Tec™ fabric provides both weather protection and zero noice, ..
Clearance! Size chart . Swif-Tec„ double-weave technology features a lightweight, t.. Size chart . Printed arrows design, wind/water-resistant Aero-Tec, upper that provides weather prote.. Size chart . Made of ultra-lightweight Aero-tec, fabric provides both weather protection and zero no..